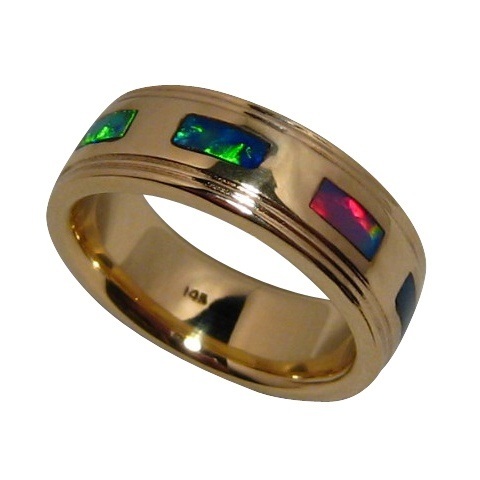 Mens inlay Opal ring in 14k Gold in a classic design with grooves on the edge. The ring is substantial in weight and is inlaid with eight very bright and colorful rectangle cut Opals. This is a stylish Opal ring for men. 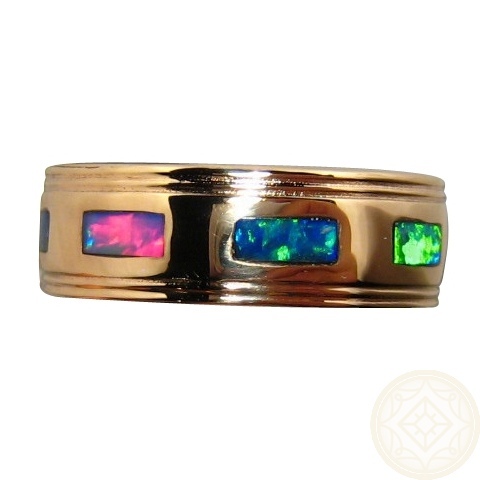 A 14k Gold band that weighs 15 grams is inlaid with eight Gem Lightning Ridge Black Crystal Opals that are very bright and colorful. It is a classic style of Gold band that can be used for many occasions and if considering using this as a Wedding Band or everyday wear, please read Care for Opal Information before you purchase. This ring has been sold however you can inquire about having one Made to Order through the ask a question link above.